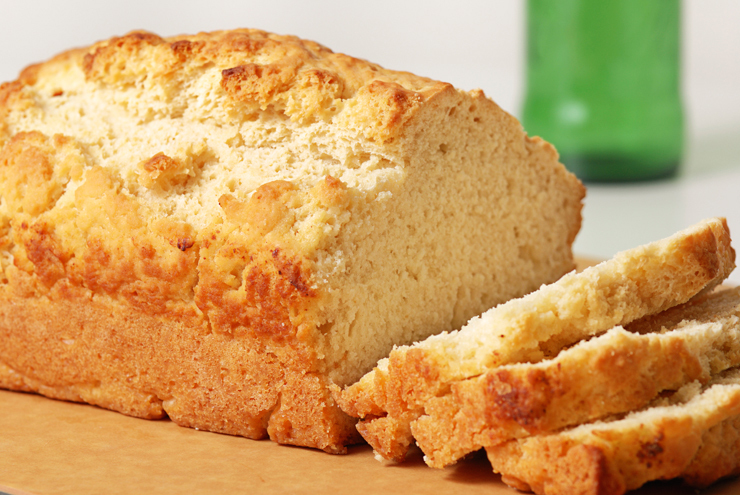 Beer bread is a form of quick bread that doesn’t use yeast and uses baking powder to allow it to rise. Since beer is made from yeast and other grains, it gives this quick bread that yeasty, fresh baked flavor that makes yeast breads so delicious. It’s also a great way to use up any beer you have in the house! You can actually use any beer that you want. Each style of beer will make its own unique loaf of bread. Make sure the beer is at room temperature before you begin making this bread. Preheat the oven to 375 degrees Fahrenheit. Spray a standard sized loaf pan with nonstick cooking spray. Add the flour, baking powder, sugar, and salt to a large mixing bowl and whisk lightly with a large whisk. Stir in one bottle of room temperature beer. Melt the butter in a covered, microwave safe dish for 20-30 seconds and stir into the batter. Pour the batter into the prepared loaf pan and brush the top with olive oil. Bake in the center of the oven for 35-40 minutes or until a toothpick inserted in the center comes out clean. Let stand on the counter for five minutes and then turn the bread onto a wire rack for it to cool. Cheddar Beer Bread. Follow the recipe listed above, and dd ½ cup grated cheddar cheese with the dry ingredients before adding the beer. Top the beer bread with 2 tablespoons grated cheddar cheese before placing it in the oven. Ginger Beer Bread. Follow the recipe listed above, but use 1 tablespoon granulated sugar and 2 tablespoons molasses instead of the 3 tablespoons of sugar listed in the recipe. Stir in 1 teaspoon of dried ginger powder with the dry ingredients and use ginger beer. Cranberry Orange Bread. Follow the recipe listed above and stir ½ cup dried cranberries and 2 teaspoons grated orange rind in with the dry ingredients. Use 12 ounces of orange soda instead of the beer. Sweet Bread. Follow the recipe listed above, but add an extra tablespoon of sugar. Use 12 ounces of your favorite sweet soda instead of the beer. After brushing the loaf with oil, sprinkle it with a teaspoon of granulated sugar. Banana Bread. Follow the recipe listed above, but use 12 ounces of soda of your choice instead of the beer or 6 ounces of banana nectar mixed with 6 ounces of sparkling water. Stir in 1/2 cup of finely chopped, ripe bananas after adding the soda. Apple Bread. Follow the recipe listed above and stir in ½ cup dried, chopped apple pieces and 1 teaspoon cinnamon with the dry ingredients. Use 12 ounces of sparkling apple juice instead of the beer.